Photo: Ryan Hastman, Dave Cournoyer, and Jason Kenney. It was the clear winner in the first round of voting in the Best of Alberta Politics 2017 survey. 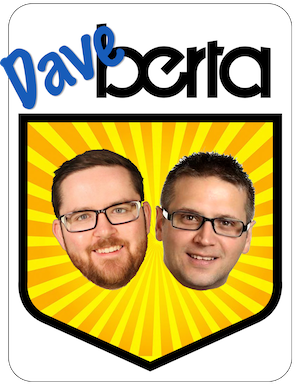 With a solid 59 percent of votes, readers of this blog and listeners of The Daveberta Podcast chose the formation of the United Conservative Party as the biggest political play of 2017. 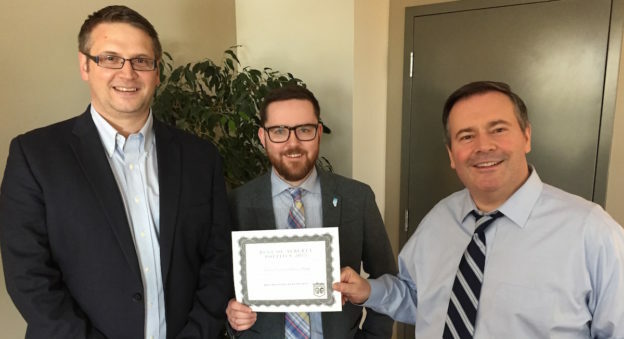 Dave Cournoyer and Ryan Hastman were pleased to present the Best Political Play of 2017 award to UCP leader Jason Kenney today at his office in the Federal Building near the Alberta Legislature. Established in July 2017 as a merger between the Progressive Conservative Association of Alberta and the Wildrose Party, the UCP currently forms the Official Opposition in the Legislative Assembly of Alberta. Its formation dramatically changed the political landscape in Alberta and mended some of the tears in a conservative movement that had been deeply divided for more than a decade. We would like to thank Mr. Kenney for taking some time out his day to sit down with us for an interview that will be included in the next episode of the Daveberta Podcast. This entry was posted in Alberta Politics and tagged Alberta PC Party, Best of Alberta Politics 2017, Dave Cournoyer, Daveberta Podcast, Jason Kenney, Ryan Hastman, United Conservative Party, Wildrose Party on March 20, 2018 by Dave Cournoyer.